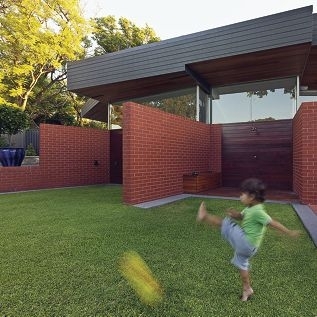 Aleksander Podias (5) kicks a ball in the back yard of his Coolbinia home. Biljana and Peter Podias moved to the small suburb in 2005 when they bought a run- down 1950s home. Mr Podias said many of their friends thought they were ‘crazy’ buying the house which they have spent the past eight years renovating. ‘We had a vision for the house,’ he said. Mrs Podias said the suburb was a hidden treasure. ‘When we were living in North Perth we didn’t know the area existed,’ she said. ‘We like that there wasn’t much traffic because if you don’t live here there is no reason to drive through. The pair enlisted architect Adrian Iredale to develop the blueprints for a renovated house designed on Ebenezer Howard’s garden city principals ” aimed at integrating open space and parks into residential developments. That principal was used when Coolbinia was first developed. The final design created a four bedroom, three-bathroom house that ‘unfolds’ down the length of the lot which was nominated for the WA Architecture Awards. Mr Podias said he and his wife did many of the renovations themselves, which added to their love of the house and area. ‘We are also close to Coolbinia Primary School which is perfect for our son Aleksander (5),’ he said.